5 Comments Published by kim on Thursday, November 29, 2007 at 8:25 PM. me: "hey em, let's make some pom-pom animals for the tree. what kind of animal do you want to make?" em: "an emu! a giraffe! a lemur!" em: "how was your day, mommy?" me: "i had a great day because i got to spend it with you. how was your day, emmy?" em: "i had a noony-noo day and a doony day. *insert wild laughter here*"
hope your day was just as noony as ours. just one day to go till the end of november. hallejuah! 1 Comments Published by kim on Saturday, January 20, 2007 at 12:08 AM. this is my daily view of the em-ster. she's gotten a little... clingy lately. she's a big fan of mine; i hear "mama-mama-MAAAMAAAA!" many times each day, especially when strangers (or her dad) is nearby. i reassure them (him) that this is just a phase and that she'll probably want nothing to do with me in a few months. until then, it's the emmy & mommy show, playing 24-7 at a playgroup near you. welcome two new additions to our socktacular sock family! first up is oscar the socktopus, a friendly eight-legged sea creature who enjoys fine dining and long walks on the beach. his snazzy red bow tie shows that he's always ready for a night out on the town, although he's slightly incredulous that you'd pick him to go on your date. this insecurity comes from years of being picked last in gym class, even though he's quite an athletic fellow with good ball handling skills. next to him is nake the snake, our happy argyle'd reptile extraordinaire. nake was born without eyes sadly, but has been fortunate enough to be blessed with an extra sensitive tongue. he spends most of his time hanging out at the local playground, hogging the top of the slide in hopes of surprising too-eager young tots. so what does emmy think of all this? apparently she only wants her "roh-ra" (lola)! she is most definitely NOT a fan of oscar (is he really that scary looking?) so he's been gifted to the hubby. on the plus side, she does seem to enjoy playing with her "nake" and frequently drags him around the playroom. em's friends, however, seem to be more welcoming of our growing menagerie - playmate amanda enjoyed gnawing on oscar's tentacles (who wouldn't like a little calamari, really?) while andrew carried nake all around the house. so what's next? i'm thinking of doing another monkey to improve my sewing skills; i have a great pair of striped socks that look just like a "jojo" to me! (and no, that's NOT in honor of that strange little clown girl from "jojo's circus" - seriously, her yoga show kinda creeps me out.) and yes, i DO realize that i can use more than just socks for my sewing projects (thanks, honey! ); i just haven't found the time to get to the fabric store, especially since target has so many cute socks on clearance. got any sewing ideas or requests? just let me know! maybe i'll even make you a little something too! 3 Comments Published by kim on Saturday, December 30, 2006 at 12:47 AM. i did it! i made my very first sock monkey! 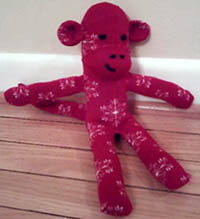 after being inspired by kiddley.com, i decided to venture into the world of handmade crafts... and what better project than a sock monkey? they're cute, supposedly easy and hey - it's a free gift for emmy! so even though i hadn't sewn ANYTHING since 7th grade home economics class, i purchased a tiny sewing machine from target and got started last night. after a quick trip to michaels for stuffing and thread, my monkey was born a couple of hours ago. welcome lola, the holiday / winter monkey! 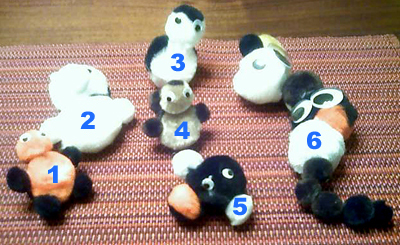 i've learned that sock monket construction is relatively easy but i totally need someone to show me how to sew the parts together (arms / tail to body, ears to head, etc.). i faked it well enough, but i'd like to learn how to hide the stitches better. i welcome any and all tips from you crazy sewing pros out there. 1 Comments Published by kim on Tuesday, December 12, 2006 at 11:52 PM. i ran across this site, loobylu, earlier tonight and am totally inspired! first of all, i *heart* all of her original illustrations and paintings. second, she's a mom who totally loves her little girl; in fact, she's making a one-of-a-kind ugly doll-esque doll for her daughter, inspired by the child's own artwork!!! i never would have thought of doing something like this, but what a cool idea - so original and so meaningful, both to mommy and daughter! and then i saw another mom's original doll, ruby - how i'd kill to have that for emmy! the doll totally reminds me of em, especially with the uneven hair and adorable poses. i've always just assumed that i'd paint for emmy (and i have - just check the playroom), but perhaps i'll be driven to take up stitching and other such crafts too. but wait, why give one gift when you can show your love on a daily basis? that's right, i could take up the art of making personalized bento boxes! elementary school emmy could open up her box at lunchtime and be greeted by a family of totoro! who knew that so many mommies have time for this?! oooh, and i'm working on a paid commissioned painting right now - yay!